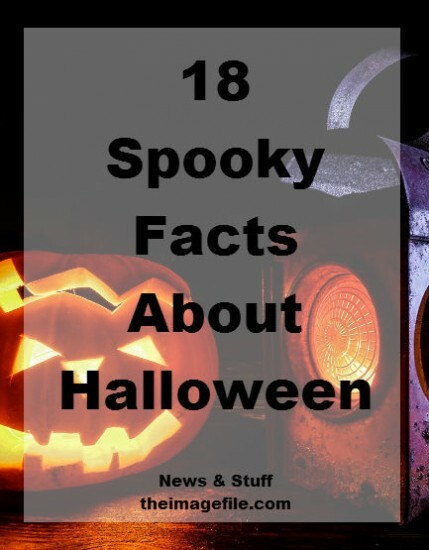 18 Spooky Facts About Halloween! As it’s Halloween this weekend we thought we would share some seasonal facts and fiction. Halloween is one of the oldest holidays in the world and is still one of the biggest celebrations in many countries around the world. But where did it all start? What are some superstitions? And how do others celebrate the day of the dead? Halloween was originally an ancient Celtic festival called Samhain. It was held on the 1st November which symbolised then first day of winter. The Celts believed that this was a day when ghosts, fairies and demons were able to mingle with the living. The festival of Samhain became what we know as Halloween when Pope Gregory III designated the 1st November as All Saints Day, therefore making the night before ‘All Hallow’s Eve’ – later becoming Halloween. Ancient Celts would set places at the dinner table for friendly spirits, leave treats on doorsteps and along roadsides as well as light candles to help loved ones find their way back to the spirit world. In 18th century Ireland a matchmaking cook might bury a ring in her mashed potatoes on Halloween night, hoping to bring true love to the diner who found it. In Scotland fortune-tellers recommended that an eligible young woman name a hazelnut for each of her suitors and then toss the nuts into a fireplace. The nut that burned to ashes rather than popping or exploding represented the girl’s future husband. Other tales said that if a young woman ate a sugary concoction made out of walnuts, hazelnuts and nutmeg before bed on Halloween night she would dream of her future husband. Also young women tossed apple-peels over their shoulders, hoping that the peels would fall on the floor in the shape of their future husbands’ initials. Some tried to learn out their futures by peering at egg yolks floating in bowls of water or stood in front of mirrors, holding candles and looking over their shoulders for their husband’s face. Other rituals said that the first guest to find a burr on a chestnut-hunt would be the first to marry while at others the first successful apple-bobber would be the first down the aisle. In Austria some people leave bread, water and a lighted lamp on the table before going to bed on Halloween night. It was once believed that these would welcome the dead souls back to earth. The Belgians believed that it is unlucky for a black cat to cross one’s path as well as being unlucky if it should enter a home or travel on a ship. Many Belgians on Halloween night light candles in memory of dead relatives. In China, the Halloween festival is known as Teng Chieh. Food and water are placed in front of photographs of family members who have departed while bonfires and lanterns are lit in order to light the paths for the spirits as they travel the earth throughout the night. Worshippers in Buddhist temples make “boats of the law” from paper which are then burned in the evening hours. There are two parts to this custom – one is in remembrance of the dead and the other in order to free spirits of the “pretas” (those who died due to an accident or drowning and therefore were never buried) so that they might ascend to heaven. The presence of the “pretas” among the living are considered dangerous by the Chinese. Monks are invited to recite sacred verses and offerings of fruit are made. In Czeckoslovakia chairs are placed by the fireside on Halloween night. There is one for each living family member as well as one for each family member’s spirit. In Germany people put away their knives on Halloween night so that returning spirits couldn’t harm them. Japan does not celebrate a western-style Halloween instead they celebrate the “Obon Festival” (also known as “Matsuri” or “Urabon”). Obon is one of the two main occasions during the Japanese year when the dead are believed to return to their birthplaces. Special foods are prepared and bright red lanterns hung everywhere as well as floated on rivers and in the sea. During the “Obon Festival”, a fire is lit every night in order to show the ancestors where their families can be found. In Mexico, Latin America and Spain Halloween is known as El Dia de los Muertos. This is a three day celebration which starts the evening of October 31 and culminates on November 2. Rather than trying to scare off ghosts and gaols this is a joyous and happy holiday where families remember their dead and continuous life. Parades are often held, people dress as skeletons and dance in the streets. Families also attend candle lit ceremonies in church and offer prayers. What are you planning to do on Halloween? Do you have any superstitions about the night?